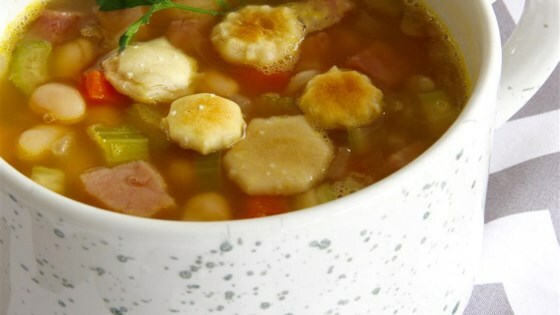 "I was in the mood for soup on a cold night and using a basic ham and bean soup, I created one that is ready in less than an hour, with items found in the pantry/fridge. Easy and delicious!" Bring water to a boil in a pot; add chicken bouillon and stir until dissolved. Drain and rinse 1 can Great Northern beans. Reduce heat to low and stir drained beans and remaining can of undrained beans into bouillon mixture in the pot. Add carrots, onion, celery, garlic, bay leaf, and black pepper to pot; bring soup to a boil. Stir ham into soup, reduce heat to low, and simmer until vegetables are tender, about 30 minutes. Season with salt. It was okay. My daughter loved it, I didn't care for it. I even followed some of the changes people made. Guess I like the long cooking method, but it made my daughter happy. I loved this soup! I used a can of cream of celery instead of fresh celery. I made this soup including all ingredients except the celery. LOVE it. For someone with my poor cooking skills this was so easy to make and so foolproof. Tastes amazing!! great recipe! only changes where that I used broth and added dry mustard and fresh parsley.corn starch not needed the juice from the beans made it the perfect consistency.